I guess it's coming wether we want it or not. JUNEAU, Alaska - Alaska anglers will be banned from wearing felt-soled wading boots in streams and rivers starting in 2012 under a decision by the Board of Fisheries. The ban is aimed at preventing the spread of disease and invasive species. The board voted 6-0 in favor of the ban Friday in Anchorage. Anglers wear felt-soled boots in streams to help their footing on wet rocks. Trout Unlimited pushed for the ban. Project director Mark Kaelke (CAL'-key) says felt stays wet longer than rubber boots and carries more river sediment. The Fisheries Board has jurisdiction over anglers only and the ban does not apply to other stream users. Better late than never I guess. Spent the last couple of days catching up in the shop after a very busy weekend in Nor Cal. 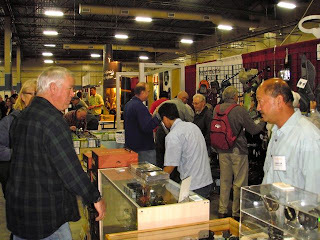 The Flyfishing Show in Pleasanton, CA was outstanding this year and it was really nice to see the enthusiasm and excitement in all the attendees. Many of our old friends stopped by and we were able to catch up on old times and plan new ones. It was great to see Dan on Friday and finally meet Ed Given after all these years. We had fun reminiscing about our old buddy Andy Puyans and the about fishing in the 70s. Charlie Bisharat and Charlie Gonzales stopped by for a visit and Noel Guzman showed up a few minutes later followed by John Sherman making the rounds. Later in the day Lee Haskins came by and introduced himself and it was like meeting an old friend. I felt like I’d known him forever and we had a nice time visiting and talking fly tying for a few minutes. Many of the guys from the forum came by and introduced themselves and it was nice to put a face with the names that are posted online. On Saturday Mike Costello was out and about and reporting a decent week of fishing for stripers to 26 lbs. The crowd on Saturday was huge and we were kept very busy and unfortunately we did not have time visit with the many friends who stopped by. Jimmie Morales came by in the thick of things and it was all I could do to say “Hi”. We’ll have to catch up another time. Old friend Mike Michelak, owner of The Fly Shop in Redding, Ca, stopped by to shoot the breeze and we had a laugh or two. 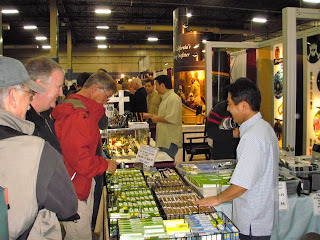 I was tickled to meet Ron Dong when he and some friends came by and I got a chance to tell him how much we enjoyed using his flies down in Baja each year. Lots of other old friends were working the show including Ken Hanley, Jay Murakoshi, Howard & Janee Mc Kinney, Joe Contaldi, Gary Anderson and Al Perryman so it was a fun weekend for me personally. I’m certain I have forgotten to mention some of the folks but my memory isn’t what it used to be. 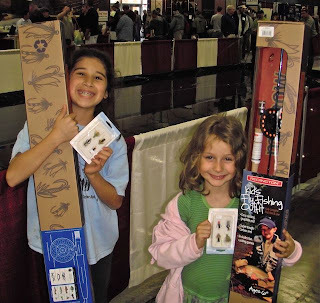 It was great to see so much enthusiasm and even a few youngsters either just getting started or already seasoned anglers. I look forward to doing it again next year.